Latest Research at the Washington University School of Medicine done on 8700 menopausal women suggests that foods rich in calcium strengthen bones better than supplements taken in the form of pills. Calcium is essential for the prevention of osteoporosis, especially in women after menopause. Researchers found that although the 'diet group' took the least calcium, an average of 830 mg per day, they had higher bone density in their spines and hipbones than women in the 'supplement group' who consumed 1,030 mg per day. Healthy bones are an impossible dream without a balanced intake of vitamins, minerals, and other important nutrients. Obtaining that intake requires a great deal of effort, more than just drinking milk! Vitamin D: 10 to 15 minutes of sunlight exposure is the best source, apart from fish, dairy, and egg yolk. Vitamin K: Green leafy vegetables, broccoli, and peas. Vitamin B12: Sardines, eggs, dairy products. 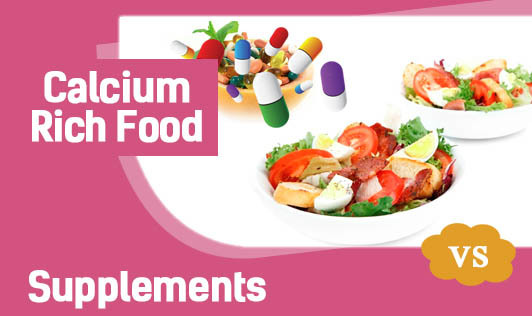 Calcium: Milk, yoghurt, vegetables such as broccoli, cabbage, ragi, and soy. Magnesium: Green vegetables and nuts. Potassium: Bananas, orange juice, raisins, vegetables, and coconut water. The femur/thigh bone is the longest and strongest bone and about 1/4th of our height.